Chisholm serves as an ambassador for St. Jude Sunday of Hope, which leads church congregations nationwide in donating to St. Jude via their Sunday offering services. 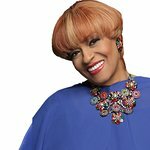 Her achievements in gospel music include Grammy, Stellar, Dove and NAACP Image awards. In addition to being a philanthropist and artist, she is also a licensed nurse. Google trends for "Jacky Clark Chisholm"
We don't have any videos related to Jacky Clark Chisholm.